In her sixth book from the Dublin Murder Squad, Tana French hits it out of the park again. I think she’s one of the best true crime writers on the market today. French’s stories move along critically, methodically, and follow the natural course of asking whodunit. We were introduced to Detectives Antoinette Conway and Stephen Moran in The Secret Place, which gave me pause because The Secret Place is my least favorite in the series. (Note: It wasn’t because of Conway and Moran. It was because the main characters are spoiled brat teenagers and they were terrifically obnoxious. The core of the plot was still good.) The Trespasser is free from pesky brats, so right away I was good to go. Conway and Moran must solve the mystery of a woman found dead in her immaculate home. She’s young and beautiful, which means the beating that caused her death was likely a domestic. An angry boyfriend, perhaps. In typical French fashion, readers follow the detectives step by step, as each layer of the onion is peeled. Privy to Conway’s inner dialogue only, we consider suspects and motives as she considers them. We analyze evidence alongside her. Moran offers input, but we, like Conway, rely on our instincts. 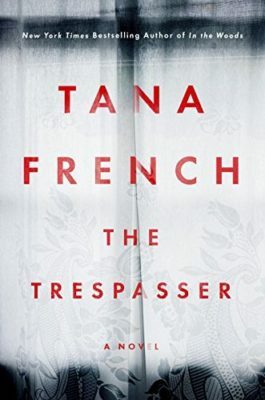 The Trespasser, like all of French’s novels, moves along at an appropriate pace. Not too fast, not too slow. In keeping with the rest of the series, it is less about what and more about how. It’s always the how, which keeps the brain spinning for possibilities. Also, I listened to it on audiobook, a first for me since I own the rest on paperback. Narrator Hilda Fay has the most delightful Irish accent. So yes, I recommend The Trespasser. More so, I recommend Tana French. A note on the Strong Female Lead Character: I recently read a thread on Twitter that had me second-guessing my frustrations with lead character Jazz in Artemis, the strong female character I did not like and who ultimately became the reason I didn’t finish the book. Was I too harsh? Am I letting male characters be messy and flawed but not extending that grace to female leads? Am I casting them as unlikable? Am I exhibiting a bias? After reading The Trespasser, I’ve cut myself the slack because Detective Antoinette Conway is as strong and flawed as they come. She is pushy and snarky. She’s harassed and prodded on a daily basis and always comes out swinging. She’s got a foul mouth and a quick hand. She is exactly the woman I’d never want to cross. So what’s the difference? The difference is in the construction. Detective Conway is a well-written, fleshed out sharp but flawed character. Jazz is a simulacrum, pieced together by a male writer who thinks Jazz is what a strong female character looks and sounds like. Those two things are not the same. Does that mean a man cannot write a strong female lead character well? Absolutely not. Ken Follett, Wally Lamb, and Khaled Hosseini all do this effectively. Perhaps, then, this issue is best handled on a case by case, or book by book, basis rather than in sweeping statements made on Twitter.